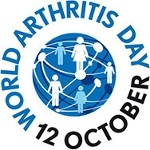 World Arthritis Day is an annual awareness day observed on October 12 in many countries throughout the world. Its main goal is to disseminate information about joint disorders that are collectively known as arthritis, as well as to raise public awareness of challenges that people with arthritis have to face every day. “Arthritis” is an umbrella term often used to describe any disorder that affects joints. Generally by arthritis people mean one of the diseases where joint pain is primary, such as rheumatoid arthritis, osteoarthritis, gout, juvenile idiopathic arthritis, and others. However, arthritis can also be a secondary condition to a wide range of diseases, from psoriasis and celiac disease to Lyme disease and lupus. Overall there are over 100 types of arthritis. Typical symptoms of arthritis include joint pain, stiffness and decreased range of motion, skin redness, warmth, and swelling of the affected joints. The disease typically becomes more common with age, but some of its types affect young people and even children and teenagers (for example, juvenile idiopathic arthritis). Arthritis is one of the most common causes of disability. World Arthritis Day was created to raise public awareness of all forms of arthritis and emphasize the importance of early diagnosis of rheumatic and musculoskeletal diseases. Some forms of arthritis, such as fibromyalgia, may remain undiagnosed for up to 5 years, and a delayed diagnosis makes it harder to treat the condition.